Antarctic meltwater lakes are far more common than once thought and could destabilise glaciers, potentially lifting sea levels by metres as global warming sets in, scientists said Wednesday. Most vulnerable are the massive, floating ice shelves that ring the Antarctic continent and help prevent inland glaciers from sliding toward the sea, they reported in the journal Nature. Antarctica holds enough frozen water to push up global oceans by tens of metres. Meltwater pooling on the surface of ice shelves can suddenly drain below the surface, fracturing the ice with heat and pressure, studies have shown. 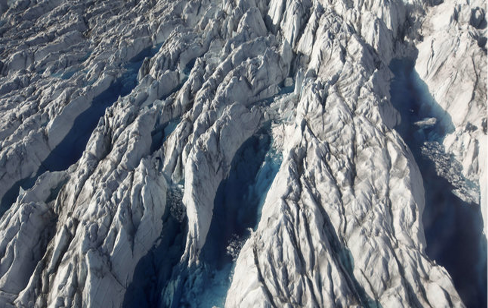 "This is widespread now, and has been going on for decades," said lead author Jonathan Kingslake, a glaciologist at Columbia University's Lamont-Doherty Earth Observatory. "Most polar scientists have considered water moving across the surface of Antarctica to be extremely rare -- but we found a lot of it over very large areas," he said in a statement. To piece together a "big picture", Kingslake and his team combed through thousands of photos taken from military aircraft starting in 1947, along with satellite images dating back to 1973. They catalogued nearly 700 distinct networks of interconnected ponds, channels and streams criss-crossing the continent. A few reached to within 600 kilometres (375 miles) of the South Pole at altitudes topping 1,300 metres (4,300 feet), where liquid water was assumed to be rare or nonexistent. Rising temperatures are eroding ice shelves -- which can be hundreds of metres thick and extend hundreds of kilometres over ocean water -- on two fronts, scientists say. From above, warmer air and shifting winds remove snow cover, exposing the bedrock ice underneath. Because ice has a darker, blueish tint, it absorbs more of the Sun's radiation rather than reflecting it back into space. But the main damage to ice shelves comes from ocean water eroding their underbellies. Normally, that erosion is compensated by the accumulation of fresh snow and ice from above. But oceans in recent decades have absorbed much of the excess heat generated by global warming, which has lifted average global air temperatures by one degree Celsius (1.8 degrees Fahrenheit) since the mid-19th century. Temperatures in Earth's polar regions have risen twice as fast during the same period. On the Antarctic Peninsula -- which juts north toward South America -- they have shot up by 3.5 C (6.3 F) in just the last 50 years. Indeed, in a dress rehearsal of what might happen elsewhere, large chunks of the peninsula's Larsen Ice Shelf fell dramatically into the ocean within days in 1995 and 2002 -- due in large part to the impact of pooling waters, scientists now believe. Another huge piece of the same ice shelf, half the size of Jamaica, is hanging by a thread and could break off at any moment, scientists monitoring the future iceberg have said. "This study tells us that there is already a lot more melting going on than we thought," said Robin Bell, a polar scientists at the same institute and lead author of a second study, also published in Nature, on Antarctic meltwater. Bell and colleagues looked at the movement of water on the surface of Nansen Ice Shelf, also part of the Antarctica peninsula, and found that its drainage system may in fact help relieve pressure. The elaborate, river-like system on the 50-kilometre (30-mile) long shelf was first observed more than a century ago, but recent aerial images and remote sensing show that it has remained remarkably stable, the study found. During the southern hemisphere summer, the meltwater is efficiently drained through sinkholes and a "roaring 400-foot-wide waterfall into the ocean," Bell said. Taken together, the two studies outline diverging scenarios of how the icy continent might respond to global warming and an increase in meltwater, the authors said.